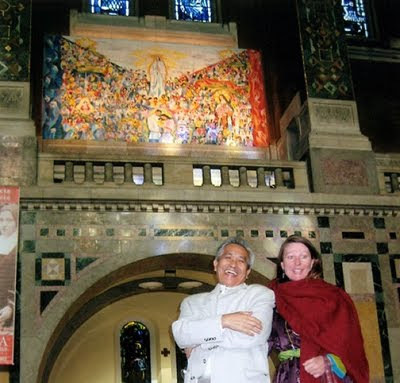 The artwork was unveiled last Oct. 18 according to the Phil. Star. 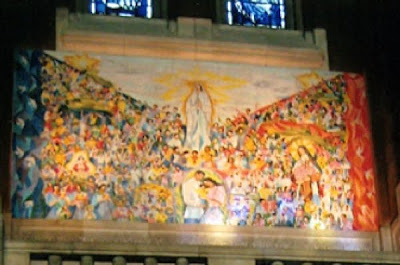 It depicts the People Power revolution of 1986 with the Virgin Mary in the center of the artwork, a burst of sunrays at the back of her head figuring prominently like the sun in the Philippine flag, while St. Therese is in the right corner admiring the crowds at the virgin's feet. Congratulations Mang Manny! Btw, I found an old writeup how the mural came to be. Read it here.